A massive assortment of games, promotions and bonuses; a meteoric VIP scheme and the breath-taking Customer Support to its players. Wait? Which airline are we talking about again? It’s not a plane?! Nope, indeed it’s not. Sit back, relax, and fasten your seatbelt. It’s a brand-new Casino experience that’s hitting new heights. High above the clouds in fact. 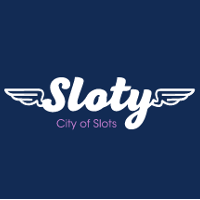 Welcome to the City of Slots: Sloty! Right from take-off, Sloty is whisking you off on a far-flung holiday with an incredible Welcome Bonus. On players’ first four deposits, they can charge up their balance with up to £1,000 and a head-spinning 50 Free Spins. Or players can make their first deposit and select the Live Casino Bonus and get flying with a 100% Bonus of up to £100! Ping the overhead button and we’ll be right with you! This is your captain speaking; if you look to the left of the aircraft, you’ll be able to see that Customer Support has a comprehensive onsite facility to containing FAQs regarding all manner of popular queries regarding accounts, registration and even cyber-security. There’s even a detailed menu of the methods the Casino offers for users to deposit into their accounts, which includes any info players need to deposit and withdraw following those sky-high wins! Sloty gives its players not one, but three ways to get in touch when the going gets tough. Friendly and knowledgeable Support Agents are always at the end of a phone, email or Live Chat to ensure gamers have everything they need to play safely and responsibly! At this Casino, that simply isn’t enough! Sloty thanks you for flying with them and hopes to see you onboard again in the near future; that’s why a first-class service is all part of the company’s ethos to make sure players come back time and time again! The air might be thin up there, but that doesn’t mean the plethora of games are on the light side too. With over 1,300 games available, players are sure to find something get them into the deep, wide-open sky! Sloty’s ready to take off with Wild Rockets where the destination of the flight is Wild symbols before your connecting flight to some combustible Free Spins! With wilds popping up on three of the game’s five reels, you know you’re in for a good flight. We’re flying so high, you can practically see heaven… or for some mythological Free Spins and Re-spins, Adelia, the Fortune Wielder from Microgaming will put the player right at the heart of this mythic five-reel fairy-tale. Or if you want to keep your feet on the ground, there’s always casino classics such as Blackjack Classic. Adjust your bet limits and go for big wins to beat the dealer! Side bets are always a good way to get that pulse quickening feel of the Casino floor! Table Games’ payouts can quiver anywhere between 97.84 and 99.27%, an RTP range that’s not to be scoffed at; whilst slots can shoot as high as 96.98% with scratch cards capped at 95.00! We know players want their Sterling to soar, and at Sloty, that’s exactly what players get! From the sky, we’ve seen casinos all over the world; but the best one? It’s right in your pocket! Sloty boasts a stunning tally of the very latest Mobile-optimized games, over 500 and growing in fact. With fast gameplay, super-sharp graphics, slot enthusiasts are sure to agree that Sloty is the place to play! Dedicated to delivering a thrilling gaming experience, Sloty is not just playable from Mobile and tablet devices, it’s optimised, dynamic and reactive to whatever screen size is being used to menus, text, buttons and graphics are tailor made to the user’s specifications. Flying with the Sloty airline is bound to have you onboard again and again. We’ve turned the seatbelt sign off; we’ve safely landed at our destination. A unique mixture of blue skies, bright cityscapes and kinetic imagery is bound to have new players air-dashing to the Cashier! Buoyant blimps aloft and the most charming hybrid Ferris-roulette wheel you’re ever likely to see; for all Sloty’s visual competence, the use of this Casino has been made meticulously easy. With a beautifully simple Account Information platform displaying, Promotions, Games, VIP and even Payment Methods are laid out equally as immaculate in the navigation menu in the Casino’s upper-left corner – How about that for extra leg room. And that’s before we’ve even left the runway into a single navigation link where players can take a bird’s eye-view of features such as Promotions, VIP and Support! Not forgetting the convenient Sloty logo, fringed with its airline-esque wing to guide you safely back to the terminal for some aeronautical spins. First class flying.